We've seen the Internet Archive publish classic software collections for MS-Dos, Amiga, Apple II, Windows 3.1, and classic arcade games. Now, the online museum is moving on to the Macintosh. 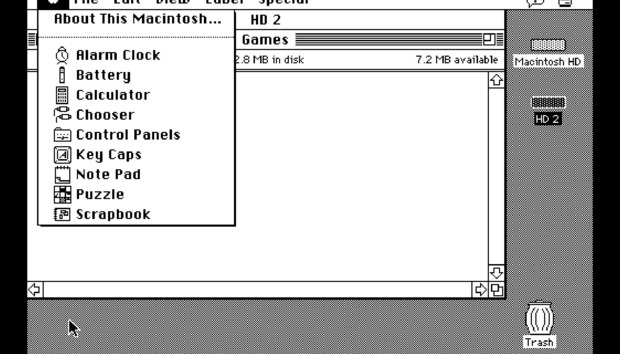 The site recently published a collection of Mac OS System software (not to be confused with the current macOS) from the 80s and 90s, including classic Macintosh computers such as the 128K and 512K. The best part? You can try all this software without having to constantly switch floppy disks on your machine. All of the software can be saved to your own PC or used with an in-browser emulator. There are more than 40 items in the online exhibit. You can find working versions of Mac OS System 6 and 7.1 with various software pre-installed. There are also software-specific emulations for games such as Dark Castle, and programs like Microsoft MultiPlan Version 1.11, Microsoft Flight Simulator, MacPaint, and MacWrite 4.5. Not everything works perfectly in the browser (I couldn't get Frogger to work, for example), but other software works just fine. There's also a full screen option to fully immerse yourself in the past. It's a fun stroll down memory lane for those who worked on the classic Macintosh, and those who didn't can see what they missed. The impact on you at home: Classic computer enthusiasts are already playing around with original Macintosh software with a local emulator. The great thing about the Internet Archive's work, however, is that it allows those who don't have the technical skill or historical knowledge to see what this iconic computer system was like. And for the experts, who knows? You might find a piece of software you'd forgotten about. Once you're done experiencing the classic Macintosh, check out some Macworld history with the Internet Archive's collection of scanned Macworld magazines. The site has nearly 150 scans of magazines from the 80s and 90s including the April 1984 premiere issue.